With one of the largest rental fleets in the West, you’ll find the rental equipment you need at Papé Material Handling. Whether you are looking for a scissor lift rental for a short-term project or a forklift rental for the season, we keep you moving with low hour, late model rentals from industry-leading manufacturers, including Hyster, Yale, and Genie. AWP-25S 350 lbs 817 lbs 30" / 4'4"
AWP-30S 350 lbs 867 lbs 30" / 4'5"
AWP-40S 300 lbs 1,040 lbs 30" / 4'8"
GR-12 500 lbs 1,581 lbs 30" / 4'5"
GR-15 500 lbs 2,192 lbs 30" / 4'5"
GR-20 500 lbs 2,451 lbs 32" / 4'5"
At Papé Material Handling, we exclusively stock proven brands and models of aerial booms. Enjoy pinpoint accuracy and streamlined controls with aerial booms. Top-caliber performance, accessibility, and safety aren’t just your priorities, but ours as well. Z34/22 Bi-Energy 500 lbs 12,000 lbs 18'6" / 5'8"
Z34/22RT DSL 500 lbs 10,450 lbs 18'7" / 6'1"
In order to help you reach the right level on a consistent basis, trust Papé Material Handling to offer cutting-edge scissor lifts. With a focus on efficiency and safety, our equipment selection will help you maximize productivity at your worksite. GL-10 350 lbs 164 lbs 3'7" / 3'7"
SLA-20 800 lbs 405 lbs 2'7" / 2'5"
SLC-24 650 lbs 347 lbs 2'7" / 2'10"
S45 500 lbs 15,230 lbs 27'10" / 7'6"
S60X 500/1000 lbs 20,740 lbs 27'9" / 8'2"
S65 500 lbs 22,270 lbs 30'11" / 8'2"
S85 500 lbs 38,000 lbs 40' / 8'2"
S125 500 lbs 44,640 lbs 46'9" / 8'2"
At Papé Material Handling, we carry a wide range of air compressors to keep you moving. Featuring cutting-edge technology and industry-standard efficiency, trust our selection to handle any project and keep you moving. *Prep charges on large excavators additional. See store for details. E26 5,666 lbs 8.5’ 5' x 7'11"
35G 7,760 lbs 10' 5'9" x 8'2"
E42 9,246 lbs 10'5" 5'9" x 8'3"
E45 10,077 lbs 10.8' 6'5" x 8'4"
E50 10,677 lbs 11.6' 6'5" x 8'4"
E55 12,271 lbs 12.9' 6'5" x 8'4"
Capable of operating in even the most difficult conditions, Bobcat track loaders from Papé Material Handling will keep you moving all year long. Featuring higher pushing force, improved ergonomics for operator comfort, and versatile attachments, these track loaders are ideal for short term or long term rentals. Featuring uncompromising designs and cutting-edge technology, our compactors have the power to effectively handle various compaction projects. Papé Material Handling keeps you moving with state-of-the-art equipment. JD 120C 29,250 lbs. 26'9" 25' x 9' x 8'6"
Hitachi 135D 30,440 lbs. 27'3" 24' x 9'4" x 8'10"
JD 160C 39,980 lbs. 28'8" 28'2" x 10'2" x 8'10"
TC-152 HO-Pac 1,824 lbs. N/A 3'10" x 2'4" x 2'4"
Dynapac CA152D 1,825 lbs. N/A 3'10" x 2'4" x 2'4"
JD310J (4x4) 15,370 lbs. 17'10" 23'3" x 11'3" x 7'2"
JD 450J 17,525 lbs. N/A 10'4" x 9' x 13'2"
JD 650J 19,750 lbs. N/A 10'8" x 9'1" x 13'11"
S35FT 3,500 lbs 6,911 lbs 6'11" / 3'2"
S50FT 5,000 lbs 8,944 lbs 7'6" / 3'6"
S50FT 4/S 5,000 lbs 9,478 lbs 7'6" / 3'6"
S80FTBCS 8,000 lbs 13,521 lbs 7'11" / 3'10"
S120FT 12,000 lbs 17,383 lbs 9'4" / 3'10"
S155FT 15,500 lbs 21,326 lbs 9'7" / 4'8"
At Papé Material Handling, we carry a wide range of industrial electric vehicles for rent. 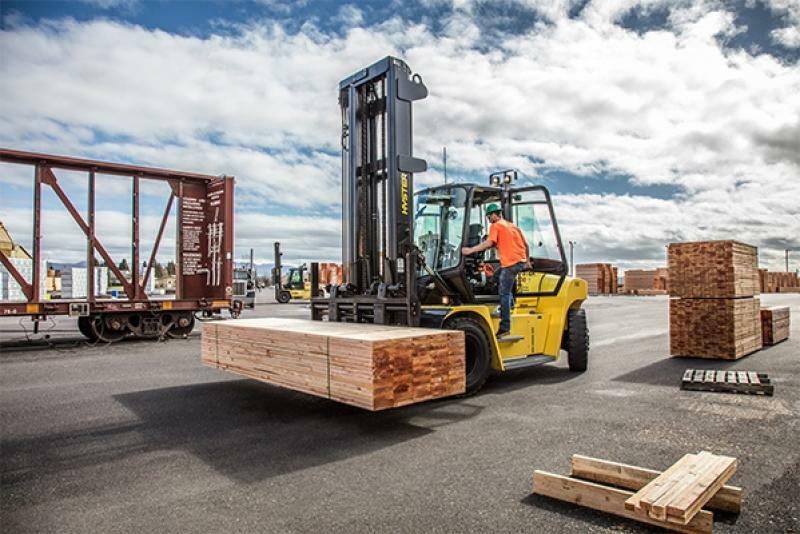 Emphasizing efficiency and effectiveness, Hyster & Yale forklifts provide uncompromising performance in various worksite applications. J35XN (3-Wheel) 3,500 lbs. 36v 3'5" x 6'10"
E35XN 3,500 lbs. 48v 3'1.2" x 6'10"
R30XMS (Narrow Aisle) 3,000 lbs. 24v 3'4" x 7'5"
N40XMR (Narrow Aisle) 4,000 lbs. 24v 2'5" x 7'9"
W40Z (Pallet Jack) 4,000 lbs. 24v 2'6" x 2'8"
MLX55 (Manual Pallet Jack) 5,5000 lbs. N/A 2'3" x 1'5"
Versatile and efficient, Papé Material Handling’s selection of internal combustion forklifts are capable of operating in limited space while using minimal energy. These innovative designs deliver superior performance and a comfort-boosting ergonomic design. S35FT (Smooth Tires) 3,500 lbs. 6'10" 7' x 3'3"
S350FT (Smooth Tires) 5,000 lbs. 7' 7'6" x 3'6"
S80FTBCS (Box Car Special) 8,000 lbs. 7'1" 8' x 3'10"
S120FT (Smooth Tires) 12,000 lbs. 7'1" 9'8" x 4'4"
S155FT (Smooth Tires) 15,000 lbs. 8'11" 9'8" x 4'9"
H50FT (Pneumatic Tires) 5,000 lbs. 7'1" 8'5" x 3'10"
H35FT (Pneumatic Tires) 3,500 lbs. 7' 7'4" x 3'6"
H50FT (Low Profile 70") 5,000 lbs. 6'7" 8'5" x 3'10"
H60FT (Pneumatic Tires) 6,000 lbs. 7'2" 8'8" x 3'10"
H80FT (Pneumatic Tires) 8,000 lbs. 7'2" 9'8" x 4'8"
H110FT (Pneumatic Tires) 11,000 lbs. 7'4" 10'10" x 4'9"
H120FT (Pneumatic Tires) 12,000 lbs. 7'4" 11' x 4'9"
H155FT (Pneumatic Tires) 15,500 lbs. 12'4" 11'9" x 6'10"
H210HD (Pneumatic Tires) 21,000 lbs. 13'8" 14'1" x 8'2"
H230HD (Pneumatic Tires) 23,000 lbs. 14'8" 14'10" x 8'2"
H280HD (Pneumatic Tires) 28,000 lbs. 14'8" 14'10" x 8'2"
H360HD (Pneumatic Tires) 36,000 lbs. 14'8" 16'10" x 8'7"
H400HD (Pneumatic Tires) 40,000 lbs. 14'5" 18' x 9'7"
H550HD 55,000 lbs 80,658 lbs 19'1" / 10'7"
H700HD 70,000 lbs 97,795 lbs 20'1" / 11'3"
H1050HDS 105,000 lbs 157,827 lbs 35'1" / 12'9"
Take power with you, to even the most remote sites, through our wide range of portable generators. Trust Papé Material Handling to deliver a vast array of sizes and energy types to keep you moving. Papé Material Handling carries a range of telehandlers rentals. Featuring four-wheel drive capabilities and impressive reach, these machines are built to be heavy-duty workhorses for various applications. GTH-5519 (Genie) 5,500 lbs 19' 12'2" / 5'11" / 6'4"
Rr 305G 305 510 lbs. Our rental fleet is stocked with late-model, low-hour, material handling equipment featuring the latest technology to help you get the job done safely and efficiently. Each piece of equipment in our fleet is thoroughly inspected by a factory trained technician after every rental and repaired as needed with OEM parts, so you can depend on performance and reliability each time you rent from Papé. Our equipment specialists are here to help you find the warehousing solutions to the challenges you face and with dozens of locations throughout the West, we’re always nearby. Looking for rent to own forklifts or other rental purchase options? We offer exceptional rent to own financing for forklifts and other warehouse equipment. Stop into the Papé Material Handling dealership nearest you for details.